While I have no money invested in the American Public’s acumen, I am continually astounded by how quickly we seem to be devolving. 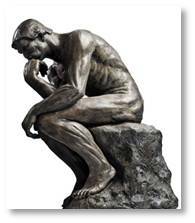 At the risk of sounding like an old fuddy duddy, I know that, as a country, we once possessed a higher standard of knowledge. Oh, sure, America had pockets of uneducated, insular people with little knowledge of anything outside their immediate surroundings. We had bigots and racists, some more open about it than others. We ha people uninterested in knowing things they don’t absolutely need to know. We learned them in school and our parents did not cut us any slack if we didn’t study. Our parents read newspapers and watched nightly news on TV that included international, national, and political information. The adults around us engaged in meaningful conversations about current events. People respected science and appreciated scientific discoveries. We expected the world to get better and wanted to be a part of that. We had no internet to spread lies and misinformation. In school we studied topics that have been removed from many school curricula, geography and civics among them. We learned how our government ran and where countries were in the world. I spent a lot of time studying the world maps that hung in most classrooms and improved my education on how the world was put together. We learned to spell names like Albuquerque and Schenectady. No one gave us a pass because these names had too many syllables. I also grew up in a time when we got all the “childhood diseases”—measles, mumps, chicken pox, whooping cough—because we had no way to avoid them. We suffered when we got sick but we really feared polio. We knew what it could do to kids and most of us knew someone who had suffered from it. And we got vaccinated for smallpox before we went into elementary school. 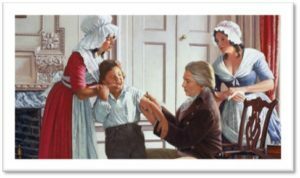 Many of us got a second smallpox vaccination when we went to college. 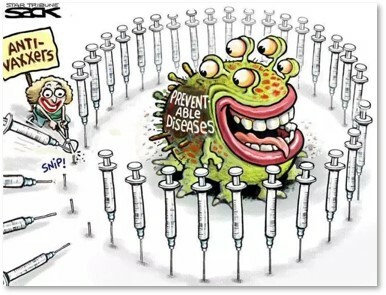 If our parents had known of a vaccine for the childhood diseases, they would have marched us to the doctor, told us not to whine about needles, and gotten us vaccinated. Then we wouldn’t have come down with fevers. We wouldn’t have coughed, itched, and swelled up. I remember mumps. It was no fun. When Jonas Salk invented his vaccine for poliomyelitis in 1955, we lined up for our shots knowing that, for the first time, we would not have to be afraid of this viral disease. It struck without warning and seemingly came out of nowhere. Doctors did not know how it spread or how people caught it. Rumors abounded. You could go to bed healthy and wake up unable to move. Scary stuff. We repeated the process when the Sabin oral vaccine came out in 1961. You couldn’t have too much protection against a disease that could cripple you and leave you with withered legs, or unable to breathe and confined to an iron lung. If you survived, that is. 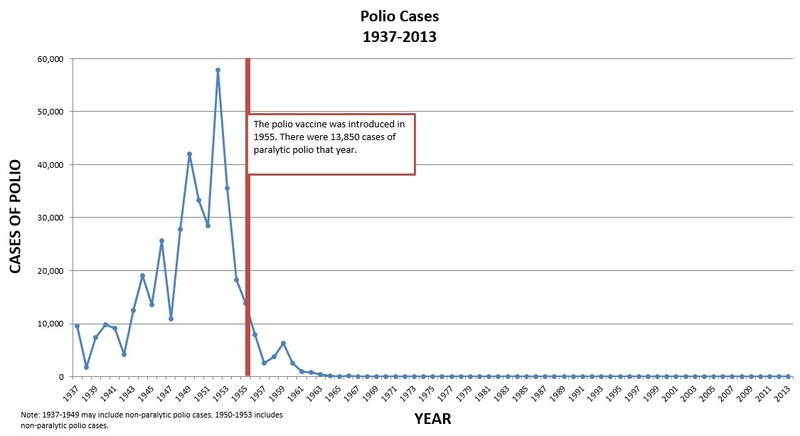 In 1952, 3,145 Americans died from polio. By 1955, there were 13,850 cases in the United States. By 1964, that number had dropped to zero. It seemed like a miracle to me and to many others of my generation. Why would any parents not want to protect their children from a serious illness? Even when 11 people died from polio caused by contaminated batch of vaccine, parents continued to vaccinate their children. So, it astonishes me to read that today’s parents would rather watch their children suffer than vaccinate them. 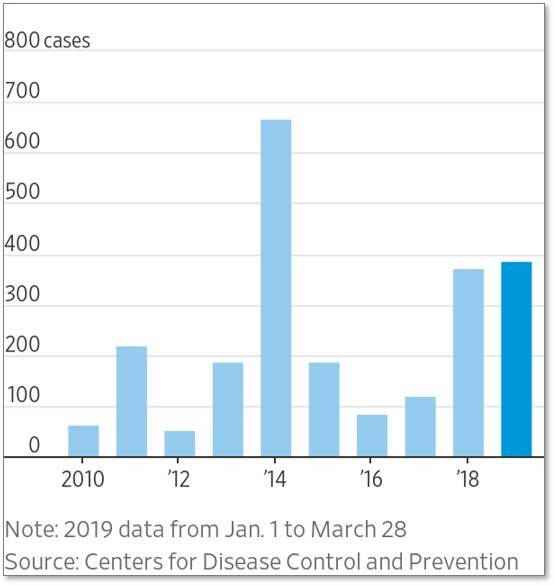 So far this year, we have seen 387 confirmed cases of measles in 17 different outbreaks, more than in all of 2018. 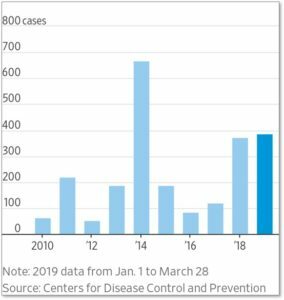 According to the Centers for Disease Control, this is the second-greatest number of cases reported in the United States since measles was declared eliminated in 2000. The highest number of reported cases since elimination was 667 in 2014. Measles is a seasonal disease and the World Health Organization says that cases rise in late winter and early spring in temperate climates. If we’re at 387 in April, we will likely exceed the 2014 number by the end of the year. Why has a disease once eliminated in North, Central, and South America come back with a vengeance? Today’s parents have (1) absorbed a lot of misinformation about vaccines and (2) had little direct experience of measles. Thus, they diminish its importance and consider it no big deal. They see vaccination as more dangerous than the disease it prevents. Some have religious beliefs that don’t allow for vaccination as a medical procedure. Others don’t like the government telling them what to do with their children. Most fear imagined problems more than they fear the disease — and that disease can lead to encephalitis, pneumonia and death..
Our education system has failed us. The CDC has failed us. If parents can dismiss measles as simply not serious, and believe a fraudulent and discredited report filled with lies and misinformation, then we have not done a good enough job of showing them how important it is to protect their children. Or what the serious consequences might be for kids who get measles. That’s how seemingly reasonable people come to believe celebrities, actors and con artists over scientists and doctors. Now, finally, a backlash has arisen against the anti-vaxxer movement. Some social media platforms (Facebook, YouTube and Pinterest) have begun stopping vaccine misinformation by blocking certain searches, banning ads, or tweaking algorithms. Lawmakers in some states have introduced bills to reduce or eliminate personal and religious vaccine exemptions. Public-health officials in Rockland County, N.Y., have banned anyone under age 18 who has not been vaccinated against measles from public places for 30 days. Parents of babies too young to vaccinate and children with compromised immune systems are insisting on stronger protections. Some young people have chose to get their vaccinations once they reach 18 and can make their own health care decisions. We took polio cases down to zero through vaccination. We eliminated smallpox through vaccination and herd immunity. We defeated measles once in the same way. Let’s not let fear, misinformation, and lack of education allow it to make a comeback. We need to set higher standards for ourselves the way we used to and then live up to those standards. The good thing about science, as Neil DeGrasse Tyson says, is that it’s true, whether or not you believe in it. This entry was posted in Health & Safety, History and tagged anti-vaxxers, CDC, Centers for Disease Control, chicken pox, Edward Jenner, internet, Jonal Salk, measles, mumps, Neil DeGrasse Tyson, polio, polio myelitis, smallpox, social media, vaccination, vaccine by Aline Kaplan. Bookmark the permalink. Let us stop the spread of childhood diseases. Stop those people that don’t remember how bad those diseases can be. I remember Chicken Pox and Measles, those diseases hurt and my children were vaccinated against them for that reason alone. A shot to immunize them last 3 to 4 seconds. If your child gets the disease they can die. 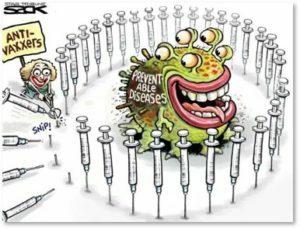 The resurgence of ‘anti vaxers” is causing HERD immunity to drop, putting the unvaccinated, uninformed and misinformed population at higher risk.